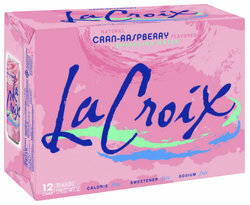 La Croix Cran-Raspberry Sparkling Water. Wonderful La Croix Sparkling water with the taste of cranberry and raspberry. Comes in a 12 count case of 12 oz cans. Cran-Raspberry La Croix sparkling water.